Elephant Parade is the world’s largest open air art exhibition of decorated elephant statues that seeks to attract public awareness and support for Asian elephant conservation. This a whimsical way to pay tribute to elephant lovers around the world. 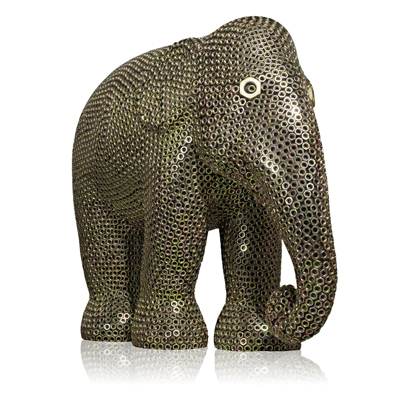 Nuts of variable height and size are used as a medium to decorate the elephant in an artistic way. The surface of the elephant is covered with golden/ silver coloured nuts to represent the existence value of the Asian elephants. The shapes of the nuts are hexagonal, which is one of the strongest shapes known. When joined together, it symbolizes a network of strength and unity.